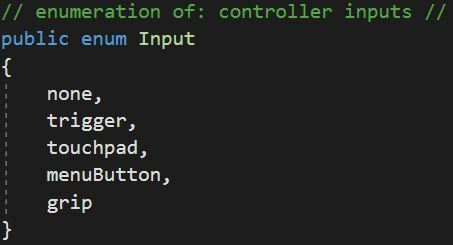 This enumeration allows you to set up a number of drop-down lists of controller inputs to choose from, as an inspector setting for any script, by which to control locomotions or any other scripts you may create. Moon Motion has input settings for nearly all of its locomotions, cyclers, and modules. Not all of them require input to function, however. Input can be either shallow or deep. This corresponds to the depth the input is pressed, as with pressing the trigger all the way or pressing the touchpad down instead of merely touching it. These different depths are used in Moon Motion mostly to locomote faster or slower, as with Booster Force Application or walking versus running when Treading. If you want to setup input that cycles through input controls for your locomotions, you can assign input to a Locomotions Cycler to cycle between locomotions with different input settings.